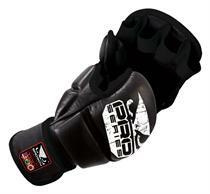 Four layers of shock-repellent padding keep your hands safe while sparring with these open-palm MMA gloves. The padding extends to the thumb for safer sparring sessions. Adjustable strap around the wrist keeps the gloves in place and offers support for striking. They have been designed specifically to mold to the user's fist after repeated use. Constructed from high quality leather throughout. Email your friend about the Bad Boy MMA Leather Training Gloves. Ask a question about the Bad Boy MMA Leather Training Gloves.